JNN 08 Oct 2014 Istanbul : Turkish Cypriots have been allowed to pray in a mosque in the Greek Cypriot-controlled southern Cyprus for the first time in 40 years. 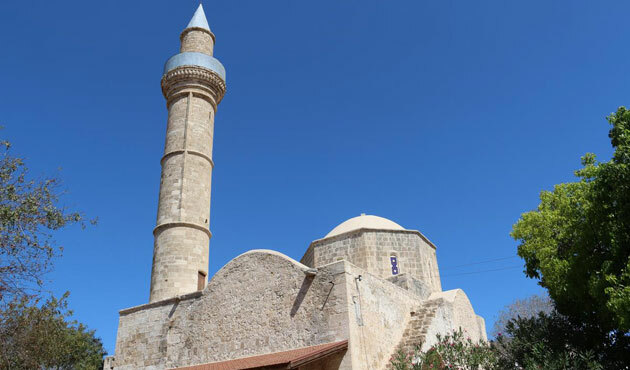 The head of Religious Affiars in the Turkish Republic of Northern Cyprus (TRNC), Prof. Dr Talip Atalay, led prayers at the Kebir mosque and visited Muslim cemeteries in the city of Baf (Paphos) and its surroundings on the invitation of Greek Cypriot Archbishop Chrysostomos II. After the prayers held at the Ottoman-era mosque, which was converted into a mosque by Mehmed Bey Ebu Bekir in the late 1500s, Dr. Atalay expressed his happiness, thanking the Turkish Cypriot Foreign Ministry – which arranged the visit – and the Swedish embassy for it mediating role. Dr. Atalay’s visit marks the first visit of a Cyprus Mufti to Baf and its surroundings since the island of Cyprus was split in 1974 following an intervention from Turkey in response to a Greek-backed military coup on the Cypriot government. Meetings between the religious leaders of Cyprus have become a regular opportunity to encourage dialogue between the two major religious groups on the island – Muslims and Christians – as the the Turkish Cypriot and Greek Cypriot governments seek to resolve the Cyprus dispute. Turkey has maintained a military presence in the island’s north as a constitutional guarantor of peace after Greek extremist militant group EOKA, which sought to unite the island with Greece, conducted a coup on the government in July 1974 after having forced Turkish Cypriots to flee enclaves. Failure to reunify the island led to the Turkish Republic of Northern Cyprus (TRNC) declaring independence in 1983, which is today only recognized by Turkey. A 2004 referendum saw Turkish Cypriots vote ‘yes’ to reunify the island, but plans failed when the vast majority of Greek Cypriots voted ‘no’. Nonetheless, the Greek Cypriot administrated southern Cyprus was accepted into the EU while the TRNC remained under international embargoes. This entry was posted in Europe and tagged Cyprus, Greek Cypriot, Greek Cypriots, island of Cyprus, Mosque, Ottoman Empire, Prayers, southern Cyprus, Talip Atalay, Turkish Cypriot Foreign Ministry, Turkish Cypriots. Bookmark the permalink.